A channel and clairvoyant since a child, she has studied philosophy, theosophy, religion, and esoteric disciplines with living masters of our time. Perhaps these two facts alone explain why people have asked her to give classes, workshops and seminars for over thirty years; or, maybe it's the laughter that is always present when she's around (she believes that the natural state of the soul is joy). In Kythera's life, miracles happen every day; angels talk to neighbors, cars heal themselves and abundance manifests. As she says, "Life is the only game in town, and we will Spiritually grow no matter how many lifetimes we fight it, so why not enjoy the ride?!?!?!?!?!?" Kythera Ann is a Gemini (Sun and Moon with Sagittarius rising) and a native Californian. She is a popular teacher and lecturer throughout the United States, has been on numerous talk shows, has written a book on the usage of sound from the Western Tradition, Songs of Light, has published a cassette with her music on it, has had many articles published in periodicals, is founder of the School of Spiritual Integrity (which networks course and meditation material to students around the world), owns/operates "Crystal Clouds," a graphics and drafting design firm, and owns/operates "Elysium Gates" a web hosting service that is focused on making a difference on the net by its community and charity activities. Kythera is married to her beloved, a Virgo (Sun and Moon with Libra rising) named Lance, who owns/operates "Lance'sLot," an accounting and business service. They have a lovely Taurus daughter, Kimberley, and a fiery Aries granddaughter, Samantha. 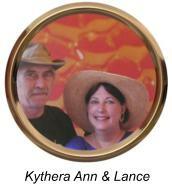 Kythera Ann and Lance live happily in their "Appalachian Paradise" in North Carolina, ...together with squirrels, raccoons, deer, blue jays, ravens, owls, their two cats, Golden Retriever, and many visiting students and friends from around the world. It helps that she's a great cook! "...she has continually impressed me with her tenacity to the "truth." She's positive, uplifting..."
"Kythera Ann...instills a deep sense of dedication and a high quality of service. We recommend Kythera's teaching abilities and high business ethics to present seminars and training programs." "She has the ability to help a student understand new knowledge and use it in their daily lives." "One must truly experience her life's enthusiasm to appreciate the broad knowledge and fulfilling qualities that she maintains as a teacher. I find her ability to convey the meaning of life very rewarding. Her love is very evident. I applaud her conviction to be totally non-judgmental. She is loved dearly and is inspired." "Since I am a Tibetan Buddhist monk, it always amazes me how Kythera's experiences and teachings parallel the explanations given to such subjects through Dzogchen meditation. She is a true Tara and proves that the mystic's experience is true in all traditions...thus proving the universal reality that is shared on all dimensions." The following is in answer to questions I'm often asked. If you are reading this, perhaps they will answer questions about me that you have. I encourage inquiries, and like others, I don't enjoy typing the same answers again and again. So I'll add the answers to common questions here as they come up. If your question isn't answered here, or in the other pages of this site, please, please, PLEASE, e-mail your inquiry. I really want each individual who reads these pages to have their questions answered and to grow in Spiritual understanding through them. Thank you for being the unique reflection of Spirit, that each of you are! "What kind of Reverend are you?" It's a very long story. To keep this short, may it suffice to say that Jesus had twelve Apostles that are recognized by modern organized Christianity. These Apostles were catalyzed, by Jesus, into being able to magnify the Divine Spark to such an extent that they were able to perform miracles, and were considered Tzaddiks (Saints) themselves. They were also able to catalyze others to do the same thing (much like Initiations in Hindu, Tibetan Buddhist, Hasidic, and Native American traditions...the ability of a Teacher/Guru to accelerate a student's/disciple's Spiritual growth, and upon the passing of the Teacher/Guru, to transfer the power to the student/disciple so that they then become the Teacher/Guru). These twelve became the founders of twelve Christian Churches (sects) each claiming Apostolic Succession (the transfer of power makes one a Spiritual leader...in theory). A process began, about 1700, when various Bishops from each of these sects got together. They understood that the normal singular and secular method of ordination (method of transmitting the power of Apostolic Succession) had become weakened and stagnant over time. These Bishops began co-consecrating each other...thus pooling their singular ordinations and connection to Spirit into a more dynamic vehicle of power. This group of Bishops eventually pooled the transmissions of all twelve Apostolic lines and became known as the "Federation of Liberal and Orthodox Catholic Bishops" (Catholic literally means "universal"). If you are ordained by one of these Bishops one becomes a Reverend/Priest/Priestess and holds all twelve Apostolic lines of succession. If you are consecrated by three Bishops you are a Bishop too, and can continue the Apostolic Succession by ordaining others. Each individual uses their ordination differently. Some quietly wield their power in traditional churches, some start their own church, some are quietly involved in mainstream business, and others, like myself, use the guise of life to be able to touch, heal, and transform the heart of mankind. Each has their talents; each utilizes them for Spirit. How I was blessed with such an honor is a long story. Without consciously seeking it, I have been given many things, by many traditions like this. Anymore, I think of myself primarily as a Universalist and very cosmopolitan. All tags have a tendency to limit, but Spirit is limitless...therefore my direct connection to Spirit is the only authority or hierarchy I choose to follow. "You aren't Jewish; how can you teach Kabbalah?" Years ago, I started to see Hebrew glyphs in meditations (though I didn't know what they were) and during my day I would hear in my mind songs in Hebrew (although I didn't know that was the language) that I would sing. I kept utilizing the songs I heard and contemplating the glyphs in my mind. This led me to realizations on many elements of Spirituality. I eventually was led to understand that the symbols and sounds came from Hebrew origin. I found this intriguing, as I have no Jewish background (this life, anyway). I kept working with these Spirit-given tools and found that the sounds and glyphs definitely changed my perceptions and altered my consciousness to move through the world in a more wholistic way. My private work with this form of meditation/contemplation continued for many years. I had no idea if anyone else had these experiences, but was content that I was receiving directly from Spirit, since all had improved my life and was filled with love. Over twenty-five years ago, I was teaching a Comparative Religion adult education course at a local college. My co-facilitator was a Tibetan Buddhist monk. As I discoursed on Western theology he made the comment, "You are a Kabbalist." I wanted to know if that was a disease! He had been raised Jewish (sister married a Hasidic Rabbi in Israel), and explained to me that my philosophy on life and method of discourse was Kabbalistic. I shared with him my meditations, and he confirmed the language. He then took me to the University library where there was a large section of Jewish Kabbalah. I became fascinated that people for thousands of years had been experiencing things I experienced, some even mentioned the same techniques! Since then, I've read everything I can and have compared it to my direct experience. I live in a Judeo-Christian world; most of my students know the stories of the New Testament better than the Old. Since Jesus was a Jew, it wasn't difficult for me to create a bridge for students to connect with traditional Jewish techniques. I believe that Kabbalah, although for a long period of history it has been held sacred within the Jewish community, is not exclusively Jewish. If it were, Spirit would not have used it to speak to me. I believe it is something more...a primary encoding of Spiritual Law, accessible to anyone who can lift their consciousness to Spirit. There are too many similarities between my experiences and those not only of Kabbalists but Native American Shamans, Druids, and other Spiritual individuals. In my conversations with these individuals, we find we all use the same consonant and vowel combinations with similar results. Our descriptions vary only because of the cultural metaphors we choose to relate them to. I don't believe one needs to be in any particular sect to be able to connect with Spirit and disseminate that information to others. What happens is that when an individual connects, they'll translate that experience into a metaphor they can relate to and use to communicate to others. As to connecting, my latest venture was creating a graduate course for ULC Seminary in comparative religion! Talk about a lot of work, "whew!"